Looking south on a late December night, the constellation of Orion, the Hunter, dominates the sky. The main outline is formed by seven stars, the brightest of which, Rigel, is to the lower right, and the second brightest, Betelgeuse, to the upper left. To the upper right is Bellatrix, and to the lower left, Saiph. Somewhat in the middle we see a line of three stars, from left to right (or east to west,) Alnitak, Alnilam and Mintaka, representing Orion’s belt. While the Arabic names of all but the brightest stars in a constellation are rarely used by amateur astronomers, such names are a reminder of an epoch, a thousand years ago, when Arab culture led the world in science, navigation and trade. 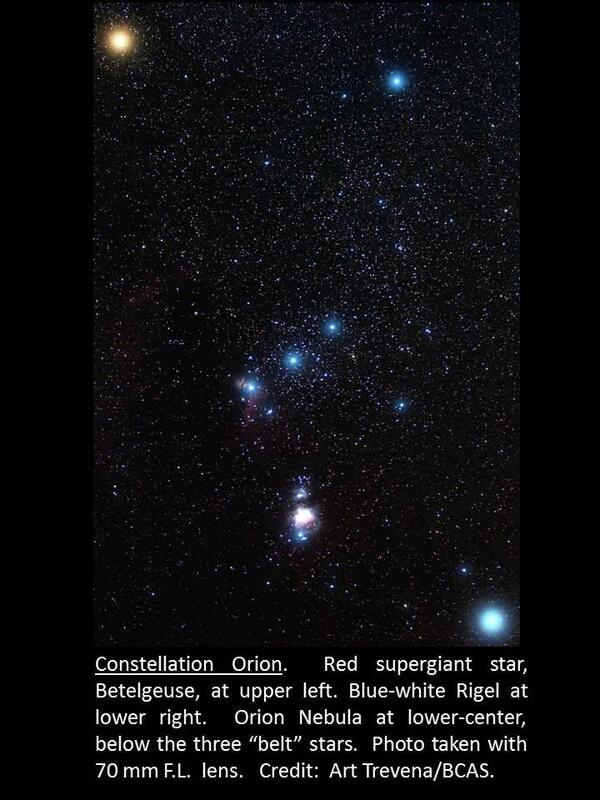 To the unaided eye, Rigel, which means foot and represents one of Orion’s feet, appears bluish-white, which contrasts well with reddish Betelgeuse. Rigel is a very hot super giant star shining with the luminosity of 40,000 suns. Betelgeuse is one of the largest stars known. If Betelgeuse occupied our Sun’s location, its surface would extend beyond the orbit of Mars. Returning to the stars of Orion’s belt, if we drop down approximately four degrees, slightly more than the width of the belt, we come to a faint, hazy patch. This is the famous Orion Nebula, an enormous star-forming region easily seen in a pair of binoculars and magnificent even in a small telescope. Follow the line of stars in the belt to the left, or east, and we eventually come to the brightest star in the entire sky, Sirius. Sirius, which belongs to the constellation Canis Major, the Great Dog, is also known as the Dog Star. Sirius has a white dwarf companion, the first such star discovered. Being much closer than Rigel and Betelgeuse, Sirius is not as intrinsically bright.